The first issue of Sanctified Together Publication is out! I am truly blessed and humbly honored to be a contributing writer with this encouraging, powerful publication. Our prayer is that you are encouraged, inspired and blessed by this publication! Please share it with all the women in your life! To see the Sanctified Together Publication online and read all the inspiring articles, click here. To receive future publications by email, click here. Your article was awesome Teresa! Great job, keep up the good work! Deb..I just love, love, love you!!! 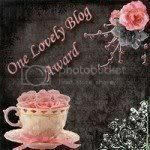 You are so awesome and I have to say that you are like a 'mom' to me when it comes to blogging!!!! MWAH!